Critically Acclaimed: William Bibbiani Reviews "Adrift"
Tales of unlikely survival are probably about as old as the concept of tales. Because if you survived a sabertooth tiger attack, the odds are exceptionally good that you’d want to tell your friends about it over the newly invented fire. Fortunately, these tales are almost always interesting. “Adrift” tells the real-life story of Tami Oldham, played here by Shailene Woodley (“The Divergent Series”), a young woman traveling the world, in no hurry to get back to San Diego. Along the way she encounters another drifter, Richard Sharp (Sam Claflin, “Journey’s End”), who sails the world because he just plain wants to. They had themselves a whirlwind romance, and when the opportunity to sail a yacht across the Pacific Ocean, in exchange for enough money to finance a whole year of aimless romantic wandering, they go for it. And it was going so well until the hurricane struck, throwing Richard overboard, and forcing Tami - an inexperienced sailor - to repair the boat and somehow find a way to cross half the Pacific without a motor, a full-sized sail, adequate rations, or any semblance of hope. “Adrift” is an inspirational tale but director Baltasar Kormákur is more interested in the love story than the unbearable elements. It’s a more effective approach than the filmmaker took in his handsome but forgettable mountaineering drama “Everest,” which featured impressive imagery but cookie-cutter characterizations. 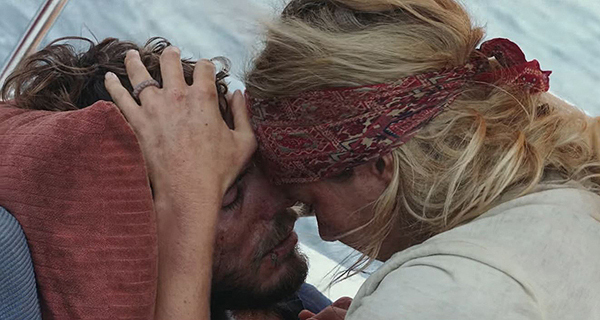 The heavy emphasis on a two-person character dynamic, with incredibly endearing actors playing both roles, makes “Adrift” seem more sweet than suspenseful. It’s a love story, first and foremost, with the beautiful courtship intercut throughout the running time with the aftermath of the horrible disaster. At its worst, “Adrift” makes that storytelling structure feel arbitrary, or as though it only serves to artificially keep key information from the audience until later on. But at its best, which is a fair amount of the time, it emphasizes the bond Tami and Richard share, and the capacity for that love, and those happy memories, to perpetuate the survival instinct. Perhaps “Adrift” could have benefitted from elaborate melodrama, or set pieces with more extreme entertainment value. It would have been more riveting, perhaps, but that would have sold the story short. This is a big film with a very intimate soul, a disaster movie that makes an impression without stooping to blockbuster gimmickry. It may be light on thrills, compared to other motion pictures of its ilk, but it's that very (relative) subtlety that leaves the biggest impression.